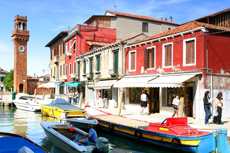 Visit Murano Island—known as the island of glassmakers—for special souvenirs and gifts made of delicate and colorful hand-blown glass. We went independently by water bus to the island of Murano. Fantastic talent the glass blowers have. Fantastic talent the glass blowers have. These are true artisans. The entire tour was amazing! Wish there had been a better description of what the glass artists were doing. Wish there had been a better description of what the glass artists were doing. The sales staff Very pushy. The visit to the church - why this church? We went to a glass blowing factory and had a demonstration; interesting to see; didn&apos;t buy anything. Beautiful island and loved the glass blowing demonstration. Glass factory tour was very nice. Glass factory tour was very nice. Wish there was more time to spend on the island. The Murano tour was exceptional as we were treated to a wonderful glass blowing demonstration. Amazing glasswork!!! Well worth the vaparetto ride (fun in itself!) to view this amazing art. It is for sale, too, if you want to part with a lot of money! Great demonstration with glass blowing and the history of the island, nice shops within walking distance of the factory display. Worth the visit as long as there isn&apos;t too big of a crowd and if you&apos;ve never seen glass blown before. The selling part is a little too long but you can ask to cut out early. A bit of a tourist trap if uninitiated, Best stuff is upstairs. What an experience to see the creations of the master glass blowers. In Venice, we had the opportunity to have a gondola tour before going to Murano Island and see an artist "glassblower" make a vase. Would have like a little more time here. We wanted to visit Murano for a while, sadly no where near enough time to look at the glass in the huge shop. With only 1 hour there, with the 20 minute demo, we only had about 1/2 hours to looks at the glass, all rather rushed.